In March 2016, we (Astrid Rao and Sneha Shetty) attended a Permaculture Design Course (PDC) organised by Academy for Earth Sustainability and conducted by Narsanna Koppula , where we were introduced to the intricacies of water harvesting and soil conservation (WH & SC) among many other themes of permaculture. In WH & SC, we learnt about “vegetative consolidation” of water harvesting structures i.e. consciously designed multi-level planting of trees, shrubs and ground cover on the water harvesting structures. The purpose is to strengthen the structures, increase biomass, enhance soil health, create micro-climates and many others. The loose soil of the newly created bunds also provide a good base for new saplings to grow in. At our 18-acre farm in Kamshet, which we call ‘Palikade’, we decided to start with designing the land forms for WH & SC. We have only the rains as a source of water here, so we decided to grow indigenous/ native, hardy, rain fed trees as well as quick growing leguminous shrubs that would fix nitrogen into the soil, provide us loads of biomass and create microclimate. We started growing saplings of the latter in our nursery in April. Then we made a plant palette of what would grow well in our area, choosing species that would serve many functions. It would be a tropical food forest that would provide for food, clothing, shelter and other needs of not just the human residents but all the stake holders including the birds, insects and micro organisms (in Narsanna’s words). This was a great opportunity to grow native trees that have been on my wish list for years (yes, i am a serious tree lover). We began the water harvesting structures in April - boundary trenches, contour trenches, a couple of ponds and a percolation tank at the highest point in the property with the hope that they will hold the water and let it percolate into the subsoil, thereby using the soil itself to hold water. We also intend to grow a mix of cereals, millets, pulses, oilseeds and green manure on the land meant for growing annual crops & orchards in future. This is to regenerate the soil (‘make the entire land a compost pit’ – Narsanna’s words). In the coming months, we will continue to plant a live fence on the boundary, comprising of various plants serving multiple functions. 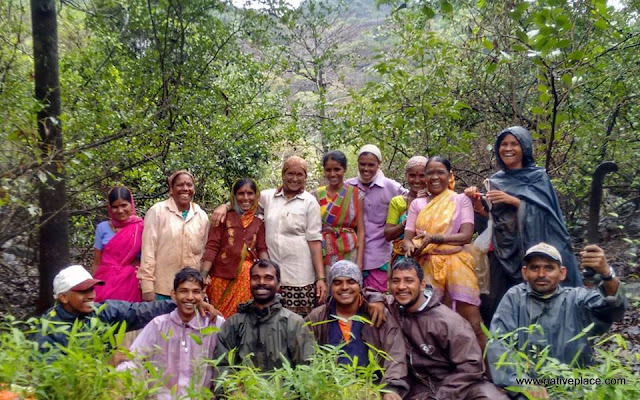 Permaculture has the answers people – and Narsanna Koppula (founder of Aranya Agricultural Alternatives, Hyderabad) is a leading light of our times. In the last one week, we have planted more than 2200 saplings and cuttings (of about 90 species), sowed hundreds of seeds and will continue to populate the bunds with ground cover (grasses, climbers and shrubs) of various types that will all do their bit to contribute to the fertility of soil and up our sustainability quotient. Wishing you a very Happy Van Mahotsav – we at Native Place and Nirvana Adventures are happy to contribute to the mammoth task that the Maharashtra govt has undertaken to plant 2 crore trees by the 1st of July 2016. We are grateful that we could source about 1,000 plants from Government nurseries (Forest Dept- Shirota, Social Forestry - Pune & PWD- Pune) at very affordable rates. Thanks a ton, guys!